As it’s in consideration to publish a Slanted issue about Hong Kong, Slanted’s art director Lars Harmsen went there in November 2017 to discover the design scene. 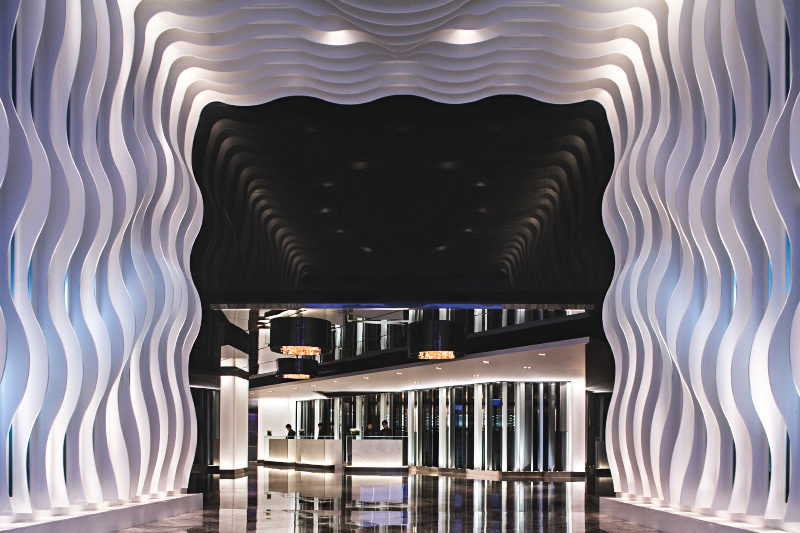 His exciting trip has been supported by the amazing hotel The Mira Hong Kong, which is a member of Design Hotels. This was notable at the very first sight. Lars was flashed by the amazing interior design: white curving and mirrored walls, incredible carpets, jade-green bamboo staks combined with natural textures. And last but not least: amazing lights, lamps and giant chandeliers. Beyond traditional Asian hospitality the hotel offers on each of its 492 rooms and suites a sleek, portable, and complimentary WiFi device for use on-the-go, allowing for 24 / 7 connectivity and sharing the signal to up to ten devices. A great technology that we’ve have never heard before! Overlooking orchid-scented Kowloon Park, The Mira Hong Kong is located in the heart of Tsim Sha Tsui, the heart of Hong Kong’s commercial, shopping, dining and entertainment district. Owner Martin Lee says: “We want to introduce a new kind of modern cultural lifestyle into Chinese society. This is much more than just ‘new is better.’ This is about creating a cultural context for all of the changes in retail, hotels, restaurants and the so-called new wave of China that is influencing the world. The Mira Hong Kong brand introduces a chic, upscale hospitality concept designed for tech-savvy design aficionados who appreciate tasteful and stylish interiors and personalized, intuitive service.” Arne Jacobsen’s Egg chairs are in each room! Lars was invited to experience the great restaurant Cuisine Cuisine—Finest Cantonese and Chinese delicacies with a unique contemporary twist. Incredible food he has never tasted before! Slanted will definitely come back! Architects: Edmond Wong of designcorp, Andrew Choy of Atelier C+ and William Lim of CL3 Architect Ltd.
Buchstaben im Kopf. Was Kreative über das Lesen wissen sollten, um Leselust zu gestalten.